All the transforms applied to the SKCanvas object are consolidated in a single instance of the SKMatrix structure. This is a standard 3-by-3 transform matrix similar to those in all modern 2D graphics systems. As you've seen, you can use transforms in SkiaSharp without knowing about the transform matrix, but the transform matrix is important from a theoretical perspective, and it is crucial when using transforms to modify paths or for handling complex touch input, both of which are demonstrated in this article and the next. The current transform matrix applied to the SKCanvas is available at any time by accessing the read-only TotalMatrix property. You can set a new transform matrix using the SetMatrix method, and you can restore that transform matrix to default values by calling ResetMatrix. The only other SKCanvas member that directly works with the canvas's matrix transform is Concat which concatenates two matrices by multiplying them together. The SKMatrix default constructor does not return an identity matrix. It returns a matrix with all of the cells set to zero. Do not use the SKMatrix constructor unless you plan to set those cells manually. This 1-by-3 matrix represents a three-dimensional point with the Z coordinate set to 1. There are mathematical reasons (discussed later) why a two-dimensional matrix transform requires working in three dimensions. You can think of this 1-by-3 matrix as representing a point in a 3D coordinate system, but always on the 2D plane where Z equals 1. A 180-degree rotation is equivalent to flipping an object horizontally and vertically, which is also accomplished by setting scale factors of –1. All these types of transforms are classified as affine transforms. Affine transforms never involve the third column of the matrix, which remains at the default values of 0, 0, and 1. The article Non-Affine Transforms discusses non-affine transforms. One significant advantage with using the transform matrix is that composite transforms can be obtained by matrix multiplication, which is often referred to in the SkiaSharp documentation as concatenation. Many of the transform-related methods in SKCanvas refer to "pre-concatenation" or "pre-concat." This refers to the order of multiplication, which is important because matrix multiplication is not commutative. For example, the documentation for the Translate method says that it "Pre-concats the current matrix with the specified translation," while the documentation for the Scale method says that it "Pre-concats the current matrix with the specified scale." This means that the transform specified by the method call is the multiplier (the left-hand operand) and the current transform matrix is the multiplicand (the right-hand operand). SKMatrix also defines a property named Values of type float. This property can be used to set or obtain the nine values in one shot in the order ScaleX, SkewX, TransX, SkewY, ScaleY, TransY, Persp0, Persp1, and Persp2. This is the complete two-dimensional affine transform. The affine transform preserves parallel lines, which means that a rectangle is never transformed into anything other than a parallelogram. SKMatrix also defines several static methods that concatenate two matrices, which means to multiply them. These methods are named Concat, PostConcat, and PreConcat, and there are two versions of each. These methods have no return values; instead, they reference existing SKMatrix values through ref arguments. In the following example, A, B, and R (for "result") are all SKMatrix values. These methods do not concatenate a rotate transform to an existing transform. The methods set all the cells of the matrix. They are functionally identical to the MakeRotation and MakeRotationDegrees methods except that they don't instantiate the SKMatrix value. The HendecagramPath object has a center at (0, 0), and the 11 points of the star extend outward from that center by 100 units in all directions. This means that the path has both positive and negative coordinates. 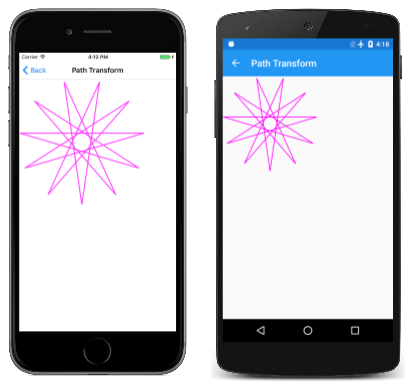 The Path Transform page prefers to work with a star three times as large, and with all positive coordinates. Moreover, it doesn't want one point of the star to point straight up. It wants instead for one point of the star to point straight down. (Because the star has 11 points, it can't have both.) This requires rotating the star by 360 degrees divided by 22. The consecutive multiplications aid in understanding what each transform does. The scale transform increases the size of the path coordinates by a factor of 3, so the coordinates range from –300 to 300. The rotate transform rotates the star around its origin. The translate transform then shifts it by 300 pixels right and down, so all the coordinates become positive. This rotates the path around its center first, and then translates it 100 pixels to the right and down so all the coordinates are positive. The star is then increased in size relative to its new upper-left corner, which is the point (0, 0). The method is called TryInverse because not all matrices are invertible, but a non-invertible matrix is not likely to be used for a graphics transform. If you use that last method, keep in mind that the SKRect structure is not capable of representing a rotated rectangle. The method only makes sense for an SKMatrix value representing translation and scaling. The TouchPoint class displays a translucent circle that can be dragged around the screen. TouchPoint requires that an SKCanvasView or an element that is a parent of an SKCanvasView have the TouchEffect attached. Set the Capture property to true. In the TouchAction event handler, the program must call the ProcessTouchEvent method in TouchPoint for each TouchPoint instance. The method returns true if the touch event resulted in the touch point moving. Also, the PaintSurface handler must call the Paint method in each TouchPoint instance, passing to it the SKCanvas object. TouchPoint demonstrates a common way that a SkiaSharp visual can be encapsulated in a separate class. The class can define properties for specifying characteristics of the visual, and a method named Paint with an SKCanvas argument can render it. 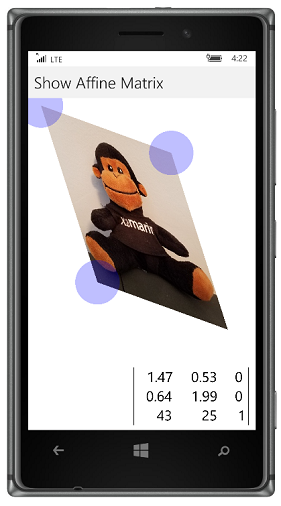 The Center property of TouchPoint indicates the location of the object. This property can be set to initialize the location; the property changes when the user drags the circle around the canvas. 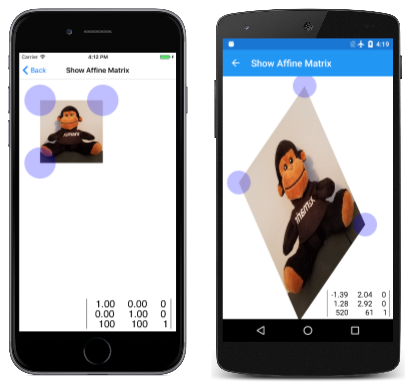 The Show Affine Matrix Page also requires the MatrixDisplay class. This class displays the cells of an SKMatrix object. It has two public methods: Measure to obtain the dimensions of the rendered matrix, and Paint to display it. The class contains a MatrixPaint property of type SKPaint that can be replaced for a different font size or color. An affine matrix is uniquely defined by three points. The three TouchPoint objects correspond to the upper-left, upper-right, and lower-left corners of the bitmap. Because an affine matrix is only capable of transforming a rectangle into a parallelogram, the fourth point is implied by the other three. The constructor concludes with a call to ComputeMatrix, which calculates the cells of an SKMatrix object from these three points. If any TouchPoint has moved, then the method calls ComputeMatrix again and invalidates the surface. Although it seems as if the touch points drag the corners of the bitmap, that's only an illusion. The matrix calculated from the touch points transforms the bitmap so that the corners coincide with the touch points. It is more natural for users to move, resize, and rotate bitmaps not by dragging the corners, but by using one or two fingers directly on the object to drag, pinch, and rotate. This is covered in the next article Touch Manipulation. This works for scaling, rotation, and even skewing, but it is not capable of the most basic of transforms, which is translation. The problem is that the 2-by-2 matrix represents a linear transform in two dimensions. A linear transform preserves some basic arithmetic operations, but one of the implications is that a linear transform never alters the point (0, 0). A linear transform makes translation impossible. The cell labeled SkewXY means that the value skews the X coordinate based on values of Y; the cell SkewXZ means that the value skews the X coordinate based on values of Z; and values skew similarly for the other Skew cells. Everything stays on the two-dimensional plane where Z equals 1, but the SkewXZ and SkewYZ cells effectively become two-dimensional translation factors. Non-zero values of Persp0 and Persp1 result in transforms that move objects off the two-dimensional plane where Z equals 1. What happens when those objects are moved back to that plane is covered in the article on Non-Affine Transforms.